Welcome, faithful reader. Please join us in our efforts to rightly elevate America to it's once unchallenged position at the peak of world power. Due to the recent decline in our economy and waning popularity worldwide we are taking action. With an uncertain future we must rebuild our past, so welcome to the first edition of The Patriotic Historical Revisionist Society of America's first propaganda newsletter. Make sure to write your congressman and include this link to support the pro-America movement. We start with little known stories of American greatness as they are remembered and celebrated by our European friends across the Atlantic ocean. 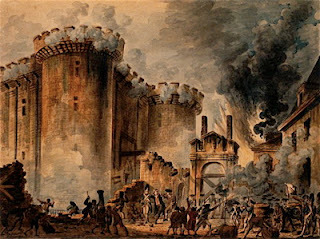 Many Americans of French ancestry observe Bastille Day on every July 14, and they know that the holiday commemorates the third major event of the French revolution in 1789 when the Bastille, a monolithic prison fortress, was overrun by the bourgeoisie. What many historians leave out of the story robs our founding fathers of some measure of their legendary historical status. The French revolution is closely tied to the economic downturn suffered by the working class after Louis XVI backed the American revolution, thus striking a blow to their hated enemy, the English. Being true and righteous liberators of oppressed people, Thomas Jefferson and Benjamin Franklin secretly traveled to France to lead the bourgeoisie on their aggressive storming of the iconic prison fortress. Although the two great American leaders faced many challenges, such as the constant distraction of French women demanding sexual satisfaction, and rallying the French men hourly to avoid mass surrender, the typical composure and style of the young American leaders prevailed. And that is the story of how Jefferson and Franklin defeated not one, but TWO European world powers. The amazing legacy that the founding fathers earned championing the oppressed American masses stands on it's own merit. But it is truly astounding to think that these men were so faithful to their ideals that they were willing to go against their only international ally in the name of liberty. And the world rightly took notice of the upstart country that was running the scene, and fell in line to absorb and emulate the growing culture and grace. So the next time July 14th rolls around instead of waving the French flag, wear your finest sweatpants and drink beer in a lawn chair in your yard. This will help remind your neighbors that they live in the best damn country in the world. And to any reader unfortunate enough not to be American themselves, you are welcome.